In the era of apprehensible information served by most of the brands through professional websites, mutinous twitter arrived with something totally conflicting. Its unerring 140 characters limit has educated many people to utilize the limited space in a more efficient manner. Anything above 140 characters is abbreviated due to inhibited nature of the SMS protocol used in the social networking site. In a world lead by social networking sites, it would be safe to surrender ourselves to the behemoth. Following post provides one the most comprehensive list of best twitter clients for Mac. Twitter has changed the whole equation and has solved many riddles of the bewildered marketers and information greedy users. No one has been spared from the inveigling clutch of twitter. There are already hundreds if not thousands of competitive twitter clients available for Mac, Windows, iOS, Android, Windows Phone or any other platform. The recent revelation of Tweetbot for Mac has only exacerbated the competition to win the title of the best twitter clients for Mac. At some point later, we will cover twitter apps for Windows users as well. As of writing this article, first alpha version of tweetbot has been released publicly. Are there more twitter apps for Mac, you ask? Well, TweetDeck, Echofon, twitterrific and many other applications have been around for quite a long time. 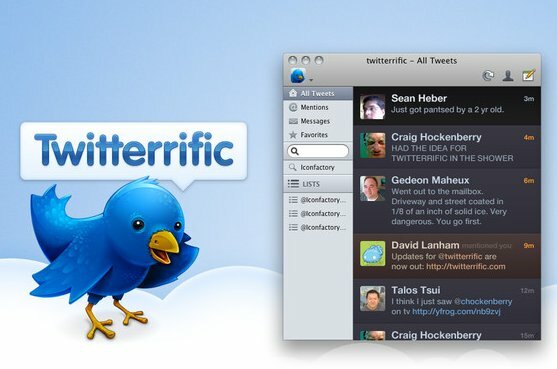 What are the points taken into consideration while compiling the list of the best twitter apps for Mac? Let’s jump to the list, shall we? I may be a little biased here. TweetDeck is something I personally use for many years. TweetDeck has a very simple user interface. It is an Adobe air based application, but the same could be used on the Google chrome browser as well. Twitter is designed to give you much more option on your hand. It results in a simple application to overwhelming twitter client based on your configuration. Users can open a multitude of columns simultaneously and configure them according to their comfort. The standalone twitter client was so impressive that twitter has gone ahead and acquired it. It inherits the support for multiple URL shortening service including like of bit.ly. It will make it easy for marketers to measure the reach and ROI of the campaign subsequently. Support for Facebook, LinkedIn, Foursquare and multiple twitter accounts is something comes in very handy at times. Global filter is yet another selling point of TweetDeck. Sometime trending topic becomes an annoyance, smart global filters will let you mute certain topics or hashtags. Column wise notification pop-up, sound is yet another welcome addition to those who wish to receive notification from certain list on twitter (or column). Attaching media like images, videos are extremely easy. It also offers a schedule of tweets provided it is running all the time in the background. Overall, it is one of the most complete twitter client available for Mac for free. If you want to refrain yourself away from the overwhelming UI of TweetDeck, then Echofon is the best option available in the iTunes store. 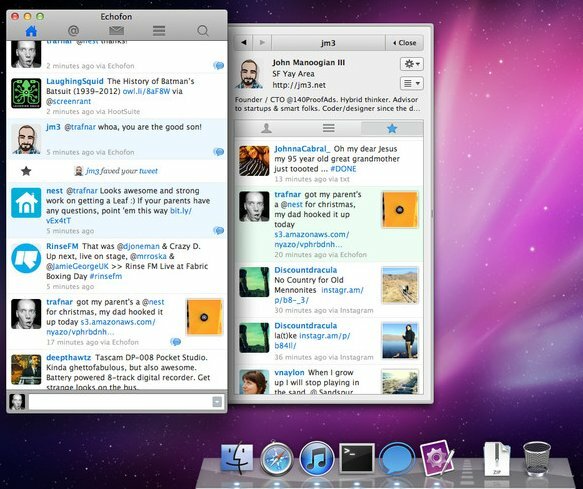 Echofon is a minimalistic twitter client for Mac. But don’t let its look deceive you, it is one of the most powerful twitter client out there. Over the period of time it has evolved as one of the robust twitter application which is also available on another platform by Apple. Unlike, TweetDeck it displays the thumbnails of the media attached in your timeline. Clicking on the image or other media will pop up the window displaying it in its full glory. It also stays in sync with your iPhone. 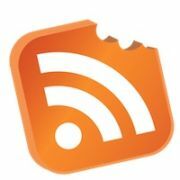 Support for drag and drop function to attach images will come in handy if you often share media on twitter. It supports attachment of iTunes music, current page from Safari, photos and more. What we like about Echofon is its simplicity, syncing with other iOS device and support for muting of application, hashtags and lists. Of course, power user or multiple account users can add multiple accounts in Echofon but managing multiple accounts is cumbersome compared to TweetDeck. Accounts switching option is pretty impressive but it still doesn’t use full screen of your Mac efficiently. Twitterrific has been around in iOS community for quite a long time. 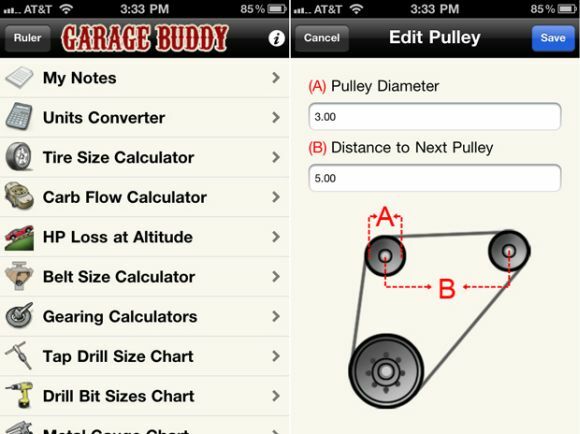 It has a separate version for iPad, iPhone and Mac. However, we have to admit that, it is by far the best twitter client for iPad users. But, of course, that doesn’t make it less intriguing for Mac users. Once again, Twitterrific is an exceptional example of how a minimal client should be approached without trammeling user’s experience. Similar to Echofon, it will sync your timeline position between iPhone, iPad and Mac. Apart from all the usual features, keyboard control is a most handy feature of twitterrific. Another impressive feature of it is support for ‘translation’. It has integrated support for different languages which can be used smartly to convert tweets into your native language. Unlike other twitter clients, twitterrific is notoriously known to restrain users from enjoying all features. For example multiple account, multiple windows support is not available in the free version which is not the case in any of the twitter clients for Mac we have discussed so far. Twitterrific is a colorful client and gives you different themes to use. What we like the most is support for Instapaper, ReadItLater (pocket now) and Readability third-party apps, keyboard control, reply all, URL shortening, easy to upload video and pictures etc. For a limited period of time Twitterrific is available for $4.99 from iTunes store. Go grab it before it is too late. You will not regret after purchasing this simple yet powerful twitter app for Mac. Well, we admit that this is a controversial inclusion. However, looking at the track record of tweetbot for iPhone and iPad, the developers have forced us to include this upcoming twitter client for Mac. 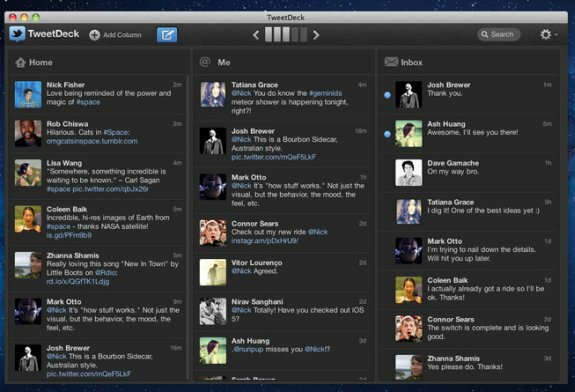 The first alpha version of Tweetbot for Mac has just been announced couple of days back (11th July 2012). The client still is in alpha version and hence it may throw few inroads in your journey. 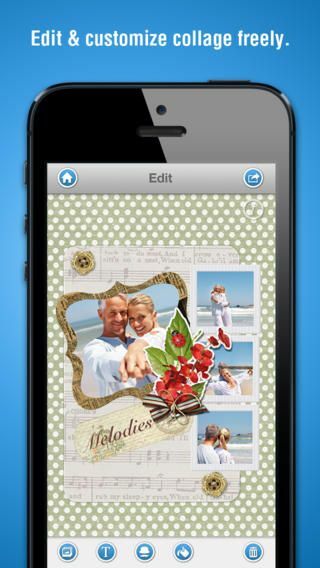 It will adopt most of the features from iOS counterpart. Support for multiple windows, multiple accounts have been integrated, but the more elegant integration will follow soon. 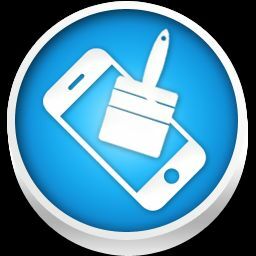 Multiple timeline, quick switching between multiple accounts, mute filters, syncing of the timeline between iPhone, iPad and Mac clients are some of the expected features. It will be too early to spell it out from the competition yet. This is a right for tweetbot users to get a chance to test the alpha version of this upcoming twitter client for Mac on their Mac OS 10.7+ for free. Developers have no intention to provide it for free when the final stable version is prepared. Initially, TweetDeck and HootSuite were fierce competitors of each other. Much like TweetDeck, HootSuite is also an all-in-one solution to manage multiple social networking accounts like Twitter, Facebook, LinkedIn, Foursquare, MySpace, Mixi and many other. However, it does come with conditions attached to it. Free edition of Hootsuite will only allow you to manage/ maintain 5 profiles also many other functions have been crippled to discourage users from using the free version. Hootsuite is more of a product for an enterprise level person. It provides different analytics integrate. 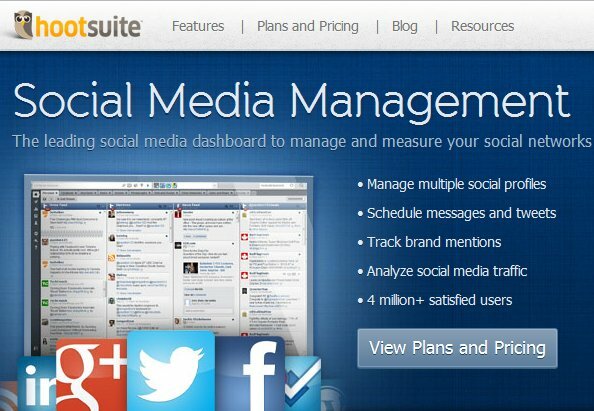 If you want to manage Facebook, twitter, Google+ and other campaign then Hootsuite is the right product for you. Many popular brands are endorsing hootsuite, so you may eventually think of trying it out. Multiple column support, easy retweet, reply, DM and many other functionalities are similar to counterpart TweetDeck. Here is a small list of twitter clients that didn’t make into our list but still needs our due attention. Of course, it would not be possible for us to enlist each and every twitter clients for Mac. Have you any other client in your mind or you’re obsessed with? Have your say in our comment section.